Until April 18, I'll be circumnavigating the world working as a volunteer web reporter aboard Peace Boat, a Japanese NGO committed to peace, human rights, equal and sustainable development and respect for the environment. To read my reports about the voyage, click on the ship in the right-hand column below. Japanese food to go is really good! From any convenience store, such as 7-11, you can buy a lunch box, or bento, for $5 or $6. 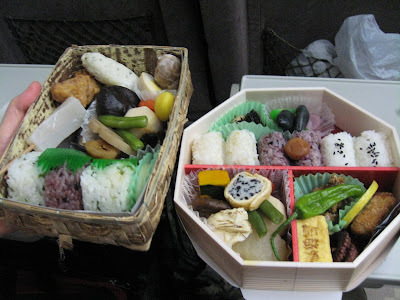 The bento are usually really delicious and contain rice, pickled vegetables, breaded shrimp, pickled plums, vegetables, egg, and lot of other delicious morsels of food. I say morsels because everything comes in bite-sized pieces, and there are many kinds of food so the meal never gets boring! The only thing I don't like is that bento, like Japanese food in general, is heavily packaged. I think that Japan is as bad as or worse than the U.S. when it comes to packaging food, unnecessarily using lots of plastic, cardboard and styrofoam. Much of this packaging can be recycled, but still it would be better not to use it in the first place. The disposable chopsticks, used in cheap and mid-level restaurants, waste a lot of wood, but are probably not as bad as the plastic knives, forks and spoons used in the U.S. Both Japan and the United States could learn from poorer countries like Bolivia where the food is not heavily packaged. 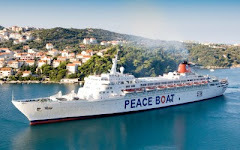 For updates about the voyage, click on the photo of the ship.